This book’s main mission is to present a general introduction to the Urdu ghazal itself, as well as to the greatest Urdu poet. It also provides the opportunity for those already familiar with the genre to examine the Divan-e-Ghalib in a new perspective, by providing a concentrated analysis of certain central words, motifs, and images clusters taken together in a novel anthological approach. The central thesis of the book is that these motifs, as utilized by Ghalib, are not important in and by themselves, but in the relationships among them. The poet’s innovative exploration of these connections reflects brilliantly the myriad of complex conditions and tensions of human existence itself. The book focuses on the phenomenon of poetic love, the figure of the beloved (in her various manifestations), and the triad of locations central to Ghaib’s ghazals: the lane of the beloved, the lover’s house, and the desert. These traditional topoi are examined in detailed and comprehensive sequence, comparing and contrasting Ghalib’s ingeniously inventive approach to the tradition. The final chapter discusses three of Ghalib’s best-known ghazals, in order to show the breadth, universality, and continuing relevance, even to the current era, of Ghalib’s distinctive voice and philosophical vision. 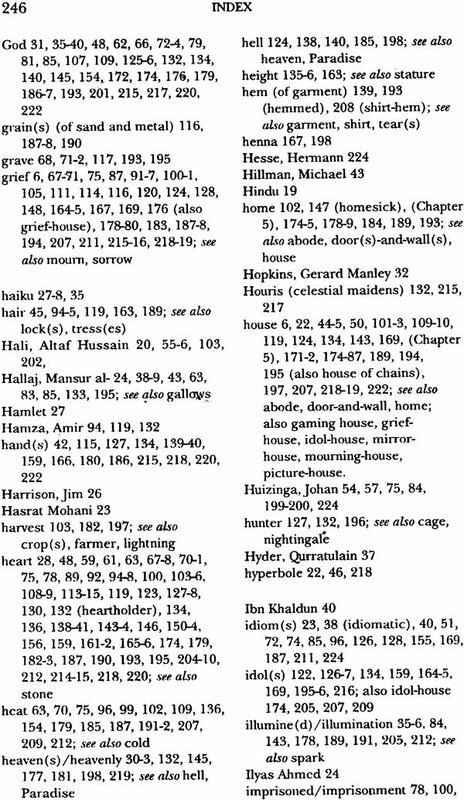 The book concludes with an index uniquely designed to be a useful interactive companion to the book itself, to be consulted as needed in order to aid the reader in understanding Ghalib’s poetry in a non-linear-we might say-nuclear perspective. Brain Q. Silver received his Ph.D. from the University of Chicago under the guidance of Professor C.M. Naim, and has taught at several American has taught at several American Universities, most notably as Associate Professor of Urdu and Indo-Muslim Studies at Harvard. He was Chief of the Urdu Service at the Voice of America for 21 years, and Ethnomusicologist and World Music Curator for another five years. He has also performed on the sitar in concerts and music festivals throughout the world. All modern critics of Ghalib, including the author of this interesting volume, are the children of Altaf Husain Hali (1837- 1914), whose seminal Yadgar-e-Ghalib (Memorial to Ghalib), first published in 1897, is still widely read and admired. Hali's work placed Ghalib in the perspective of Indo-Muslim poetry and poetics; more importantly, it also placed him in the vanguard of the coming century. Ghalib was shown as a poet who repaid reading even by a modern reader, notwithstanding the fact that 'Asiatic' or old style Persian poetry was no longer popular or highly regarded in India, and 'the taste for Asiatic poetry was day by day being absorbed by the European civilization' I-that is, the popularity of indigenous literatures was being swamped and overshadowed by the prestige commanded by English. Although there was 'nothing major or important in Ghalib's life except his poetry and literary activities, yet this one thing has made his life a grand event of the concluding era of the (royal) capital'. Hali granted that his book wasn't likely to be of a type which would be considered of any use to the country at that time, or which would be seen as fulfilling a felt need," yet he wrote his book out of a sense of personal attachment to Ghalib; and Ghalib's life and poetry did have material from which the nation could draw useful lessons. Hali asserted Ghalib's modernity, but not in the form of direct statements. Rather, he attributed to Ghalib qualities of mind and art which signalled an open or implied break with the tradition. For example: 'It is clear that not only in poetry, but also in his manners, dress and address, food habits, life-style, and even in the art of living and dying, Ghalib disliked to follow the popular, conventional ways." 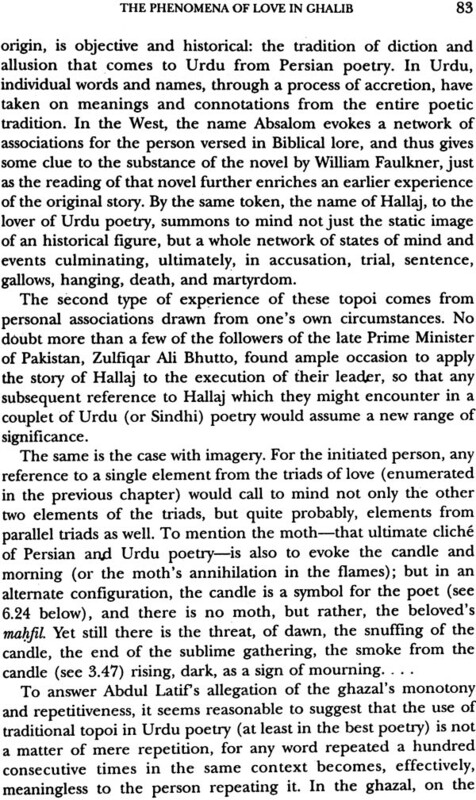 A couple of pages on, we find Hali telling us that the older masters showed their excellence and virtuosity by improving upon the themes and modes of their fore bearers, whereas Ghalib 'constructed the mansion of his ghazal on entirely different foundations. His ghazal mostly consists of themes which are unique, and which haven't at all been touched by the creative genius of other poets. Even plain themes were rendered by him in such a way as to make them entirely novel, and they are supplied with such subtleties as are not to be found in the works of other masters. Hali's other major contribution in 'modernizing' Ghalib was to emancipate him from a trap which was to a certain extent of Ghalib's own making. Until about the end of the eighteenth century, Indians writing in Persian were quite confident of their right and position as Persian writers; they regarded Indian Persian as something not essentially different from Iranian Persian, and felt themselves to be entirely competent and capable readers, producers, critics, and evaluators of Persian literature. The term sabk-i-hindi (Indian style) may not have been known then, but a distinct and valid Indo-Persian identity was well established in the minds of readers an writers of Persian in India. Persian words and phrases were used in Urdu with a healthy unconcern for their 'original' and 'authentic' Persian connotation, or construction, or pronunciation. Just as in Indian Persian, authority lay with the Indians, so in Urdu, authority lay with actual users of Urdu, and not with some shadowy master figure in far away Iran. His utterances arc not suitable as authority. How can I release myself from the hands of Talib, and Naziri, and Urfi? Of what account would he hold such as Qateel and Vaqif. This couldn't by any stretch of interpretation be treated as acknowledgment of the authority of Indian Persian writers. In this poem, Ghalib spared the great Bedil (1644-1720), his childhood hero, but in later life, he denounced even Bedil. He wrote to Abdul Ghafoor Surur in March/April 1859, 'Nasir Ali, and Bedil, and Ghanimat, for what does their Persian count? Examine the poetry of each of these with the eye of justice; to see the bracelet on your arm needs no looking glass." Ghalib didn't much bother about the contradiction inherent in his position: as an Indian Persian writer, or a user of Persian ate constructions and phrases in his Urdu poetry, he was open to the same ridicule that he heaped upon Qateel, and Bedil, and others. To the end of his life he continued to belittle Indian Persian writers (except Khusrau) and to claim exemption for himself, on grounds of 'natural affinity' with the language of the Iranians, and an equally putative discipleship of an 'Iranian master of the standard, pure language of Iran'." No one was really fooled, but Ghalib's fulminations against Indian Persian writers affected his own reputation as a master of Persian poetry. 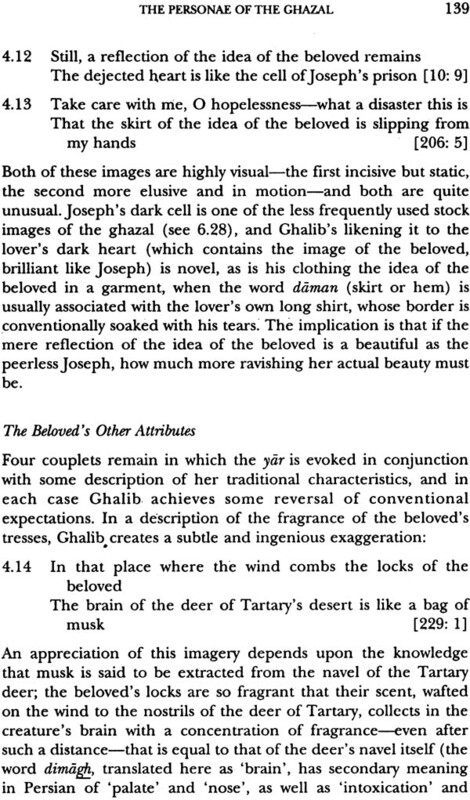 Shibli Nu'mani's five volume history of Persian poetry, called She'r ul 'Ajam (Poetry of Iran) barely mentions Ghalib. Hali and those who came after him dealt with the problem of Ghalib's Persian in a typically modem manner. First of an, Hali declared that Ghalib's Persian was as good as that of the Iranians, especially the Iranians who wrote in the Indian Style. They, Hali declared, were the true masters of innovation and imagination. Although the current Iranian fashion may be against them, all that this proves is that, 'if something was constructed in the past according to a particular mould, it cannot be fitted later in a mould of another design'. Now this is a peculiarly modern argument: if the current trend was in favour of the ancients, it didn't prove that the late arrivals were unworthy; it was just that each age had its own preferences, and one need not conform to the others. Hali also made the interesting point that Ibn Khaldun held that practice and study could enable a person to write Arabic like a native. So, Hali's argument ran, if one could achieve a native's competence in Arabic, then why not in Persian, which, 'in comparison to Arabic, is a much narrower and smaller language"." He quotes Macaulay to the effect that non-native speakers cannot compete with the native speakers in writing poetry of a high order. For once, Hali rejects that august authority, saying that this may be true of 'Europe, where in fact, poetry is the representation and inter- pretation of nature and e demands of such poetry can be discharged properly only in the mother tongue'. Ghalib there-.Fore was in a win-win position: he wrote in a poetic tradition where one need not be a native speaker to achieve excellence; and he had, in fact, a native's command of Persian. 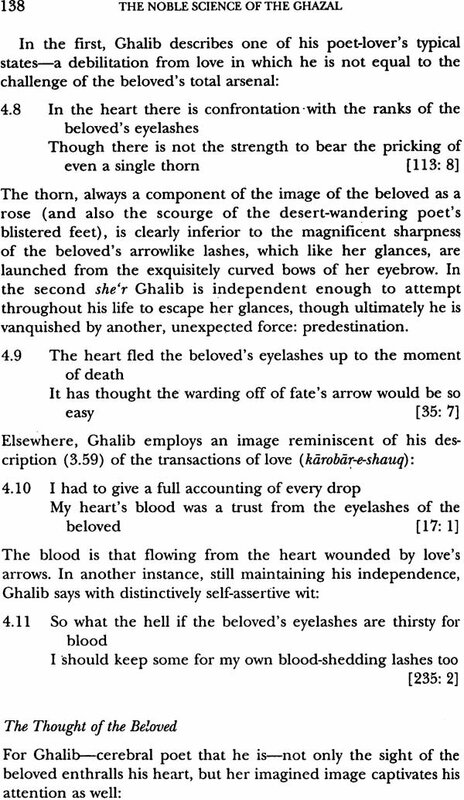 Hali also invested Ghalib with a romantic halo, a halo which was of particular appeal to the modern Indian, who was being assaulted day in and day out by stories and anecdotes and fiats proving British (or 'English') excellence, almost always at the expense of Indians; their morals, their mores, their intellectual and spiritual attainments, always being somehow found wanting by 'European' standards. In such a climate of feeling, it was extremely comforting and reassuring to know that there was one Indian who was generous to a fault, a gallant gentleman, a witty conversationalist and letter writer; a proud and self-respecting Indian who also had a sense of humour. Above all, he was a lonely figure, one who was much admired, but not in proportion to his talents, and was little understood, and was often accused of obscurity. In short, something like a Keats in the avatar of a Browning. 'The understanding of another culture or civilization', writes Milton Singer, 'requires that the foreign traveller rid himself of ethnocentrism and look at another culture in its own terms (1972: 3). Many civilizations have created in poetry their most eloquent expression of a cultural identity; such is the case with Indo- Muslim civilization. As C. M. Nairn has observed, 'of all the gifts that the two great cultures, Hindu and Persian-Muslim, brought forth in India, perhaps the greatest is the Urdu language and [its] literature; and the most precious part of that literature is the Urdu ghazal'(1974: 186). It thus becomes clear that, without an understanding of the Urdu ghazal, any inquiry into Indo-Muslim culture will necessarily be incomplete. Not only is the ghazal 'the most popular of all the classical forms of Urdu poetry' (Russell 1970a: 141), it is also the quintessential expression of Urdu cultural sensibilities. Descriptions of Indo-Muslirn life, such as Ruswa's Umsii'o fan Ada (1961, 1963) the first modern (1899) Urdu novel (Russell 1970b: 132), or Ahmed Ali's Twilight in Delhi (1966) illustrate amply the integral role that the ghazal plays in the Urdu-speaking world of the Indo-Pakistani subcontinent-though first-hand observation of any literate conversation in Urdu would demonstrate just as well the ghazal's central function in the full verbal expression of an idea. In the words of one prominent Urdu critic, Rashid Ahmed Siddiqi, 'our culture is molded in the ghazal, and the ghazal is cast in the mold of our culture; in both are combined direction and pace, color and harmony, and esteem and honor' (1969: 11). Certainly no practitioner of the Urdu ghazal is more renowned than Mirza Asadullah Khan 'Ghalib' (1797-1869). The most outspoken declaration of Ghalib's pre-eminence has been made by Abdul Rahman Bijnauri, who wrote in 1921 that 'India has two divinely inspired books: the Holy Vedas and the Divan of Ghalib (1969: 123). Most appraisals of Ghalib's importance share the tone, if not the degree, of Bijnauri's encomium: Ram Babu Saksena considers Ghalib to be 'the brightest star in the firma- ment of Urdu poetry, and the most towering genius of his age' (1940: 158), and Sardar Jafri assigns Ghalib the position of 'the most beloved Urdu poet'(: 3).1 As 'the first "modern" Urdu writer' (Schimmel 1975a: 216), Ghalib's reputation has spread well beyond the Urdu-speaking world. No other modern writer of the subcontinent-with the exceptions of Rabindranath Tagore and Muhammad Iqbal-has inspired such an extensive range of critical and biographical literature in a variety of languages, and the celebration of Ghalib's death centenary in different countries in 1969 revealed him to be a literary figure of worldwide significance. Yet in spite of-or perhaps, because of-their clear pre-eminence, both the Urdu ghazal as a poetic genre, and Ghalib as an Urdu poet, have been the centers of energetic controversy. 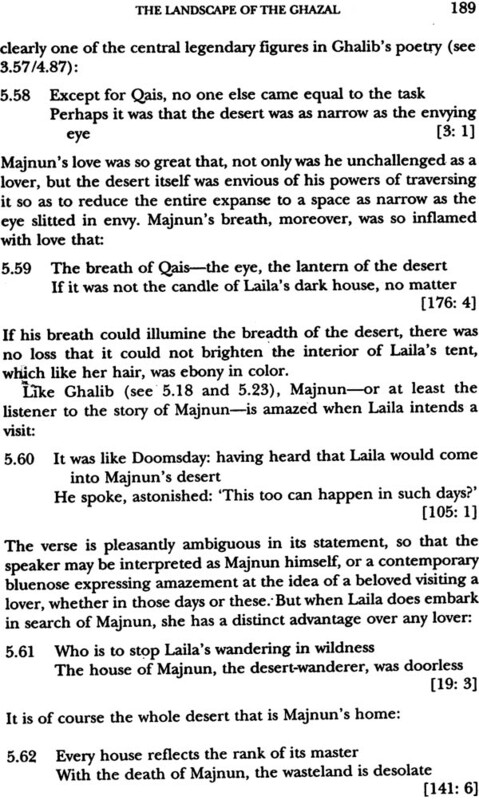 Criticism of the ghazal as a for limited in its range of expression may be found in the first modern analytic treatise on Urdu poetry (written in 1893 by Altaf Husain 'Hali', 1837-1914), the Muqaddama-e-she'r-o-sha'iri (n.d.: 119-78). Muhammad Sadiq's History of Urdu Literature is even more outspoken in its assertion that 'the ghazal stands very low in the hierarchy of literary forms'(1964: 19). 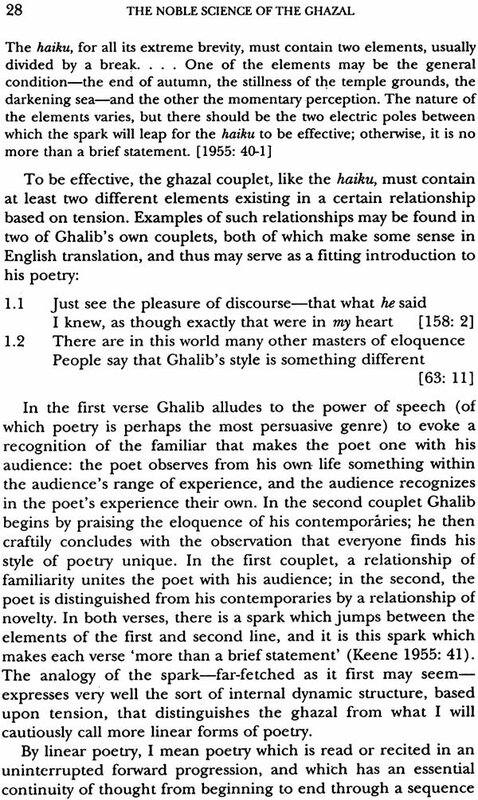 Negative appraisals of Ghalib, similarly, range from Sayyid Abdul Latif's early English book on Ghalib, in which he speaks of 'ghazal writers like Ghalib stalking, however gloriously or pompously, on the conventional ground' (1929: ii), to the characterization by Mirza Yas 'Yagana' Changezi (1883- 1960) of Ghalib as 'an old-time thief [who], along with being a thief, is inarticulate' (1969: 10). The concept of a dynamic nuclear structure is introduced in the first chapter, in a discussion of the essential formal elements of the ghazal; this nuclear structure greatly facilitates, through various techniques of compression, the completion of a full, effective poetic statement in the two lines of the individual ghazal couplet. Techniques discussed include ellipsis, inversion of word order, phonemic manipulation, repetition, parallelism, comparison and contrast, interrogative forms, allusion, personification, meter, rhyme, elision, and those techniques, such as hyperbole, ambiguity, paradox, and kineticism in imagery, which particularly distinguish Ghalib's poetry. The chapter concludes with an examination of certain social contexts of the ghazal, and the ways in which these affect the compressive and nuclear structure of the genre. 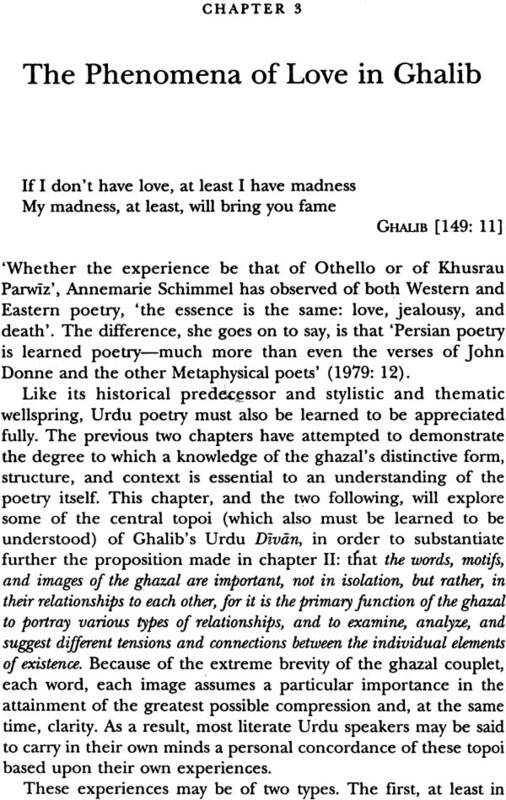 An analysis of the elemental relationships portrayed in Ghalib's ghazal poetry is begun in the second chapter, in answer to critical characterizations of the ghazal as a genre limited in scope. The central premise of this analysis is the proposition that the topoi- words, motifs, .and images-of the ghazal are important, not in isolation, but rather, in their relationships to each other; for it is the primary function of the ghazal to portray a wide spectrum of relationships, and to examine, analyze, and suggest different tensions and connections between the individual elements of existence. The chapter continues with a close analysis of two complete ghazals in terms of the relationships they portray, and concludes with a summary of some of the thematic conventions of the genre. 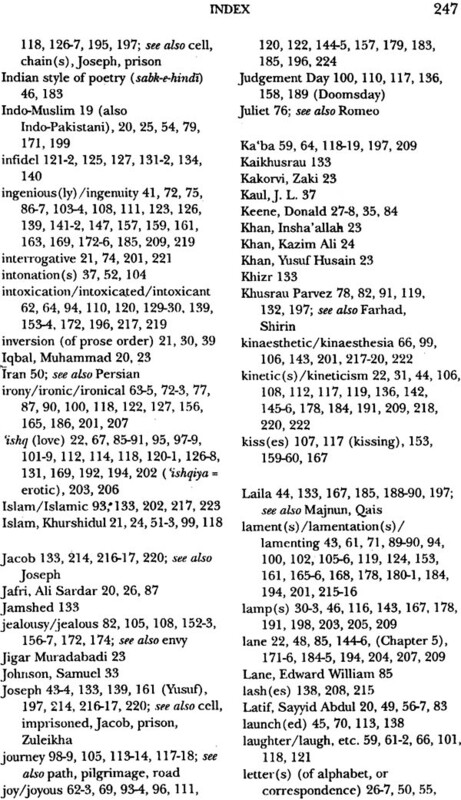 A connotative analysis of every couplet in Ghalib's Divan which includes the major words for love ('ishq, shauq, muhabbat, and ulfat) is contained in the third chapter, in order 1) to outline definitively the full range of connotations which love-the central topic of the ghazal-has for Ghalib; and 2) to begin to assemble a connotative concordance (of the basic words and images of the ghazal) of the sort that literate Urdu speakers may be said to have accumulated intuitively through extensive and sustained exposure to Urdu poetry. These couplets are presented in original English translation, and have been newly arranged according to topoi. 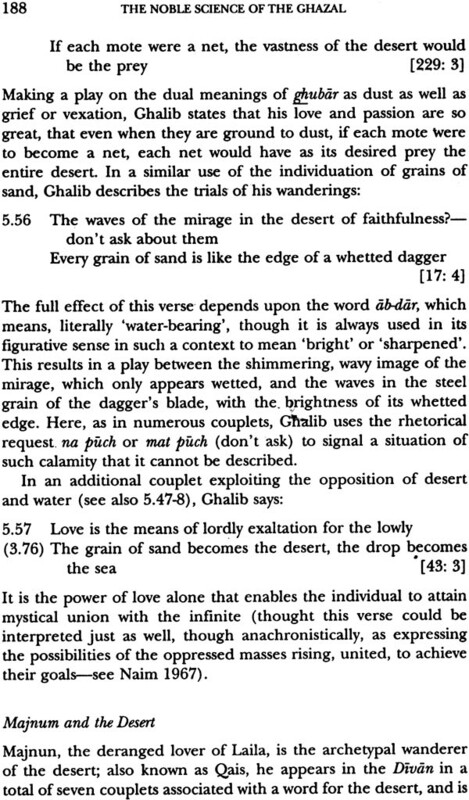 The connotative analysis continues in the fourth chapter, focusing on the central characters in the personae of the ghazal: the beloved (yar), the rival (ghair or raqib) , and the lover (ashiq); and further in the fifth chapter, in an examination of the most important spatial centres in Ghalib's ghazals: the lane of the beloved (ku-e-yar), the lover's house (ghar, khana,or makan), and the desert (dasht, sahara, or bayaban). 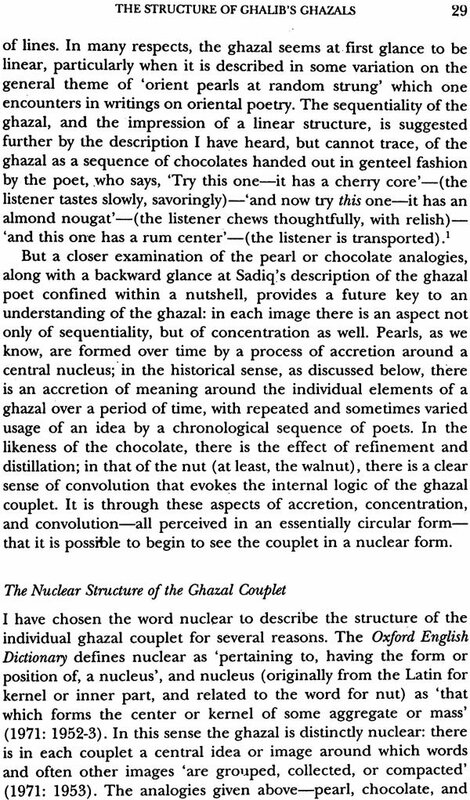 An analysis in the sixth chapter of the nuclear structure and connotative networks of three of Ghalib's most famous ghazals concludes the book, in the context of a discussion of the ghazal's capacity for scope and variety in poetic expression.